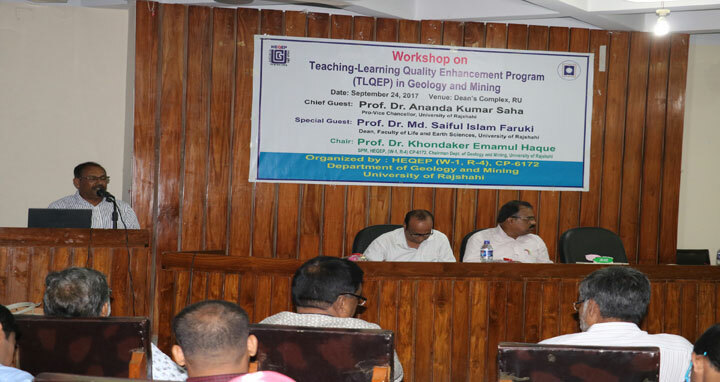 Rajshahi, 24 Sep, Abnews: A day-long seminar on “Teaching-Learning Quality Enchantment in Geology and Mining” organized by Higher Education Quality Enhancement Project (HEQEP) in association with the department of Geology and Mining of Rajshahi University (RU) was held at the Dean’s complex of the university on Sunday. Chairman of the department professor Dr. Kh. Emamul Haque also Sub project manager (SPM) of HEQEP presided over the program while Imrahim Adham of the department moderated it. Pro-vice Chancellor of RU Prof. Dr. Ananda Kumar Saha addressed the function as chief guest. The program was held in two Sessions Technical 1 and Technical Two. Among others, Director of IQAC of the university Prof Dr. Mushfique, Director General (Rtd) of Geological Survey of Bangladesh Dr. A. K. M. Khorshed Alam, Manager of Geological Division of BAPEX Muhammad Josim Uddin Shak, Prof Dr. Chowdhury Sarwar Jahan of Geology and Mining dept, GTI of Bangladesh Agriculture University Pro Dr. Md. Mozahar Ali spoke at the program. Speakers pointed over the enhancement of Quality in Teaching and learning of Geology and Mining Study.